First, thanks a lot to the exhibition organizer personals: great helper from Peter Harper, Jenny Harris, Jessica Tailby, also many thanks to the exhibition suppliers’ professional services for successfully built up our exhibition unit. 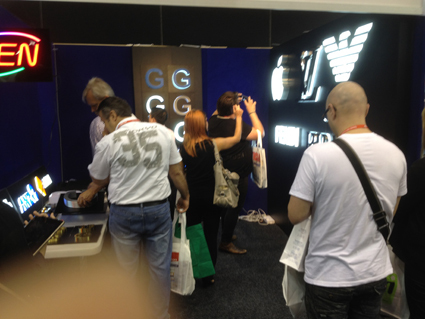 Of course, the biggest thanks should give to those new/existing customers visiting our exhibition unit at VIIE GOLD COAST 2012 this time. From this exhibition, we have connected to new and existing customers and set up business relationship. In the meaning time, we have opportunity to discuss with our existing customers closely for our further business cooperation. Upon learning each other, we understand more about what the client needs, the clients know more about our products and applications. At this exhibition, we exhibited different kinds of LED illuminated signs with fabricated signage shell that we have produced for our clients such as PRADA, Armani, FENDI, Apple, LV. Those signage are not special made for the exhibition; we just produce extra set of the signs during our normal production. As we want to show the visitors of our really quality signage products. We also exhibited some popular signs, including the magnetic LED lightbox signage we have produced for the biggest four Australia banks recently. Be proud of our product quality was highly appreciated from all visitors. The picture above is one of our client Paul at our exhibition unit, thanks him to make this moment of our exhibition.